Rudyard Kipling was an English author, storyteller and poet, chiefly remembered for his stories and poems on British soldiers in India, and his tales for children. He is best known for his fiction stories like The Jungle Book, Just So Stories and Kim. He is regarded as an innvator in the art of the short story. 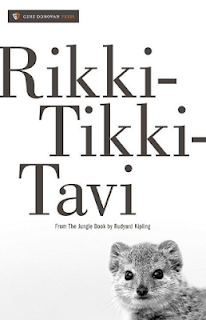 Rikki Tikki Tavi is an evergreen children's book. It was published in 1894 as part of the acclaimed collection of stories, The Jungle Book, and recently published as a hardcover and digital edition. C.S. Lewis tells that anyone should be able to enjoy reading a children's story, else it isn't a good children's story. Kipling's Jungle Book is an evergreen collection of stories. Rikki Tikki Tavi is the tale of a fearless mongoose, who ends up in a garden after a flood and then staying with the family there. He fights single-handedly against a couple of cobras who live there, protecting the family against their menace with the help of two friends from the garden, Darzee the tailorbird and Chuchundra the muskrat. This is simple narration, a simple tale and a very enjoyable one at that. Fun for children, and for grown ups, it can be a much sought change from those heavy fictions we read. Shared with First Reads at b00k r3vi3ws.